The most important elections in the long history of the IFA kick off this week. As part of Agriland’s extensive coverage of the elections, we visited each presidential candidate on their farm. 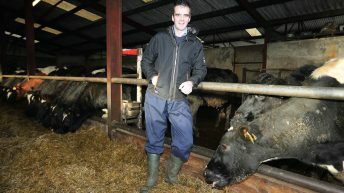 Here we meet the IFA’s current Livestock Chairman, Henry Burns. 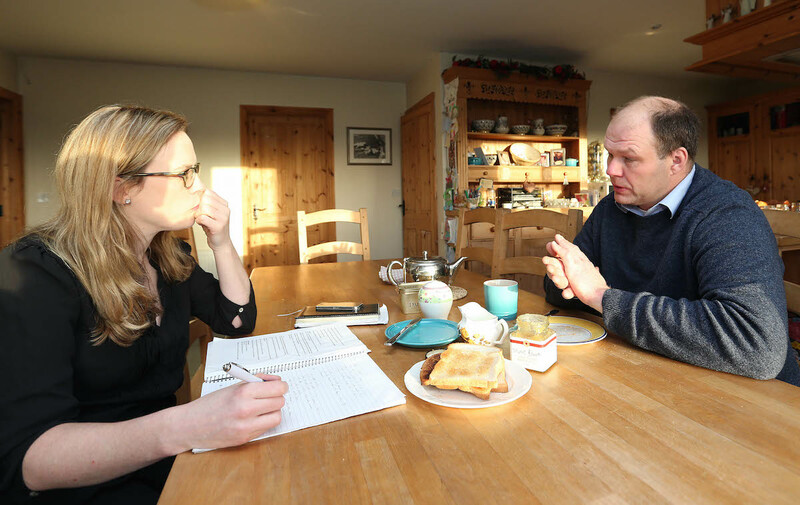 Laois drysock farmer and IFA Presidential candidate Burns has been farming near Mountmellick where he lives with his wife Claire. He keeps 60 suckler cows, 250 ewes and 40 acres of malting barley. 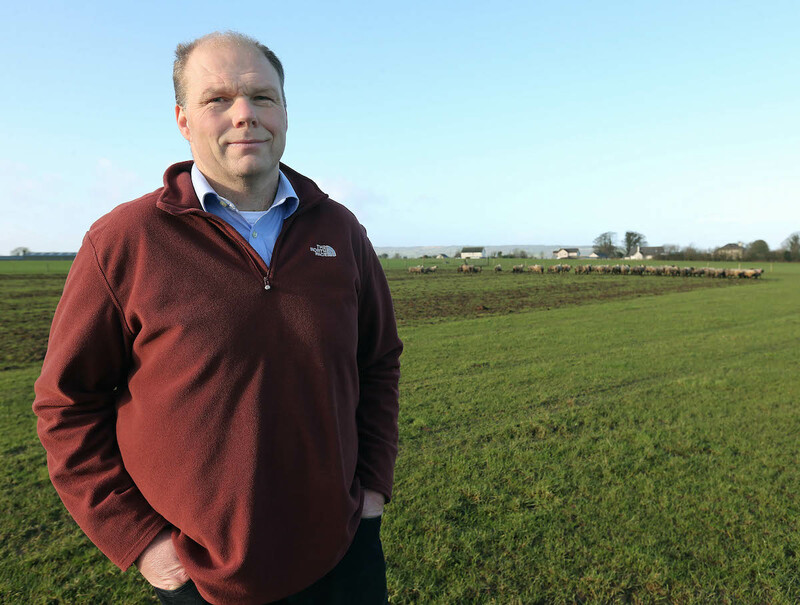 The 46 year old is IFA Livestock Chairman and is farming 75ha which he owns and a further 28ha is rented. “We have 60 suckler cows, 250 ewes, a lot of trouble with dogs a few years back reduced the sheep numbers. When the Early Retirement Scheme came out Burns’ family availed of it as it allowed his father to retire. Burns also benefitted from the scheme gaining two other land leases through it. “It was a marvelous scheme that way. I know it gave the retiring couple an income and then it gave the psychology to lease. “The psychology of leasing is very important, as short-term leasing does not lend itself to improving the land. “Land has gone expensive to rent, but it gives you options. I have a system – between sucklers, sheep and malting barley. None may be big money spinners but they keep things turning throughout the year. There are overheads for every month of the year. 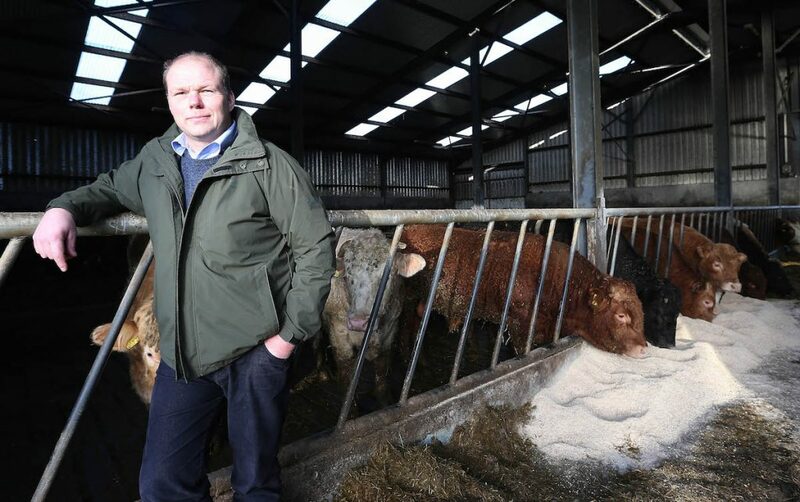 The Livestock Chairman, Burns says, is a pretty onerous role at the best of times but in 2014, he spent 200 days away from the farm on IFA work. “You grow into the IFA roles. The sheep role, I drove hard at it and I got good backing from the committee. As Chairman of the Sheep Committee, it became clear to me that I could fall between two stools and couldn’t commit to either role without taking on some help on the farm. It doesn’t work on a farm where you’re breeding cattle. “You can’t deny the figures. The figures are the figures. The figures on dairy incomes versus drystock incomes are stark. But there is a scale thing in there, a lot of them are bigger farms. “…if there is something we can exploit in the country it is young people that are driving that excitement for dairying and if it’s something we can do, then do it. “We still have 70,000 suckler farmers and at most a few thousand might go dairying. “Farmers are not getting a fair price because of the concentration of power at retail level and in terms of beef on processing side. The links between the processor and the supermarkets are becoming enshrined. “Over 60% of the beef slaughtering is done by three processors and that is linked 100% to the retailers. That may be good for the processors and retailers but it’s not good for the farmers. “It’s about getting that share back. “You have to do it on a European basis if its’ going to work and you’re looking at regulation. It’s gaining traction but Europe has to grab the bull by the horns when it comes to retail power. 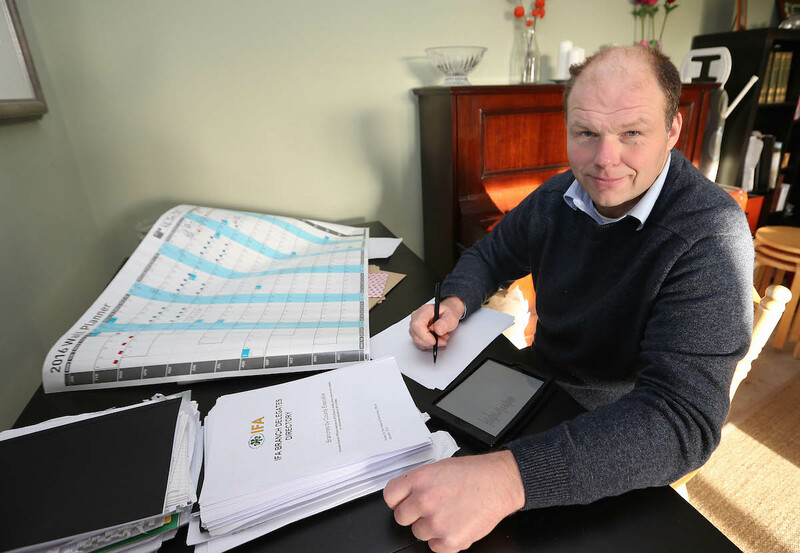 “Your ordinary family farmer with a turnover of under €100,000 can’t face that challenge on their own. “That goes for dairy as well. If you look at the liquid milk and what has happened there has seen the supermarket power be a small example of robbing brands and making it their own. It went from a valued branded product to something that’s nearly as cheap as water. Are you happy with Minister Simon Coveney? “I know one thing, we had a fair challenge with him on the drystock side of the house to convince him of the merits of putting money into sucklers. 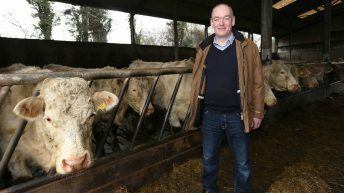 “It would have been pulled back to €20/head the suckler cow payment in his time and after a lot of lobbying and a report that showed for every €1 put in €4 is returned, it has gone back up to €80/head. “I would feel that farmers on the ground think he has not been on their side enough. He has been very good about promoting us abroad and food promotion and knowledge transfer, and they are things we will work with, but we feel that he has not been strong enough on the farmers side. An example of that is the Beef Forum – he could have been stronger sooner. “As regards the industry and promoting it and being good for it – he has been good overall. “Of course, he has the power. On CAP he was very strong, he was President of the Commission at the time and he was impressive on that and he tried to lead on it. But we feel we have to all the time get the farmer view across through. Are you happy about the exposure of recent IFA issues? “It’s good that we all now know what was going on. We should have known sooner. It took too long for it to come out. “Where it had gotten to as regards money – the lack of transparency was not sustainable. You can argue about how it came out but members have to know where their money is going. “Ultimately there is damage and to move forward trust has to be rebuilt and you can’t build trust without people knowing exactly what is going on. They are entitled to know how the money is collected and spent. “We did challenge at Council. When it became clear, when Con Lucey resigned. “There were challenges at Council but there were reassurances given that everything was in line and benchmarked. Those reassurances were given and I’m not diminishing any responsibility but I am elected onto the Livestock Committee and 2014 was a very challenging year for livestock. Does the Lucey Report go far enough? “No, it needs to go further. Con Lucey had a very short time frame to do his job and a short time frame to look at. He did a very good job on that. “There are not many recommendations in there that members are arguing with. Some feel there needs to be more independence put in there and a further look at some of the issues and I agree. “Lucey is still working on the submissions and there is a committee being put in place to implement the reforms suggested. But we can’t be prescriptive. We do need to widen the remit and get it right and if that means taking more independent advice. What about the image of the IFA? “The dissatisfaction that is out there – some of that did not happen today or yesterday. “Over the past 10 years I have got a lot of experience on the sheep and beef side, but it does mean engaging with a lot of different farmers. What I have done at national level, I have tried to do this by listening and taking people’s views on board. “People got into IFA on the understanding that it was not a salary and it has to go back to that. They say it can’t go back to that, taxation wise. But it must be that you are not distracted by your farm. “You can’t afford to be distracted by your farm and be able to put in whatever supports and help to make that work. Why vote for Henry Burns? “People should vote for me because of my experience and commitment. The fact that now we have no CEO at the moment and a man that started a year ago in Brussels and we’ve a clear out of experience in the organisations. “My credentials that I have built up in Europe over the years are crucial.